We are incredibly honoured that Farm Urban have been awarded the prestigious Duke of York Young Enterprise Award. Paul from Farm Urban received the award from Prince Andrew at the award ceremony at Huddersfield University on Tuesday. We are grateful to enterprise co-ordinator and business coach Denise Chilton, along with Liverpool Green Guild Project Manager Dave Wheatley for nominating us. Paul was competing against finalists from 19 other universities, who included tea sellers, dance groups, computer game designers and film producers. 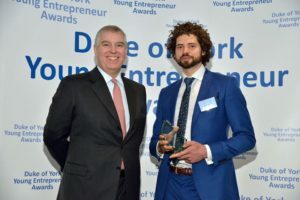 In order to win the award Paul had to give a one-minute elevator pitch to explain who Farm Urban are and what we do. Paul crafted and perfected the pitch on the long drive back from a family holiday in Somerset. 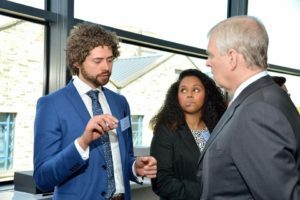 After 6 hours of being grilled in the car by wife Beth and four-year old daughter Bella, he said that giving the pitch to the Duke of York felt like light relief and probably explained how he came to win. The award ceremony was held at Huddersfield University amongst incredibly tight security, which Paul assumed was just the standard precautions that Yorkshire folk take when a Scouser is in town, but it turned out that this was more to do with the Duke being in attendance than Paul. The event gave Paul the opportunity to meet the other finalists and it was great to see so much entrepreneurship coming out of Universities in the North. Graduates have a real potential to drive forward exciting new business, and it was encouraging to see them being supported by their universities. 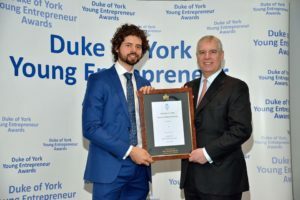 As the finalist, Paul got the chance to have a long talk to the Duke, who was interested in the concept of restaurants growing food on site all year round and he was keen to know how the produce tasted. We are really proud to have won the award as we feel that it provides a validation both for the business approach that we have adopted and the wide network of partners and supporters we are privileged to work with. Rather than rush forward and try and attract venture capital, we are drawing inspiration from our plants and trying to grow slowly and organically; developing our skills and network of collaborators to provide a fertile ground for future development and growth. The award shows that this approach is working and we’re excited to see what developments are in store for the future. We’d like to take this opportunity to thank some of the people that have helped us on our journey so far. 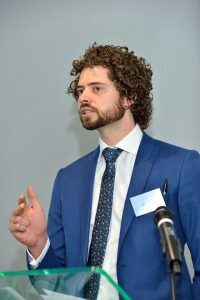 We couldn’t have done it without the incredible support of Dr. Iain Young at Liverpool University’s Institute of Integrative Biology, or Ian Parry and all the others at Liverpool Life Science’s UTC. Liverpool University’s Green Guild and Friends of the University both supported us with funding, and we are also grateful for the support and opportunities to showcase our work provided by Ness Gardens and Alder Hey Hospital Children’s Charity.